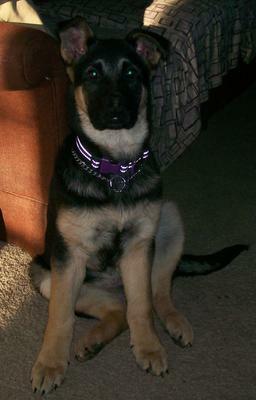 Ruby - Our New GSD puppy! Ruby loves her squeaky toy! Ruby has been with us for just two weeks now and already she knows many commands, is almost completely potty trained and can walk pretty well on a leash! She's 15 weeks old, so almost 4 months and wasn't well socialized as a young pup so it's taking quite a bit of time to get her used to other people but she sure is smart and really wants to make us happy. After losing our old dog Taz three years ago to cancer we took a while to decide on if we even wanted another dog and then to pick just the right kind. 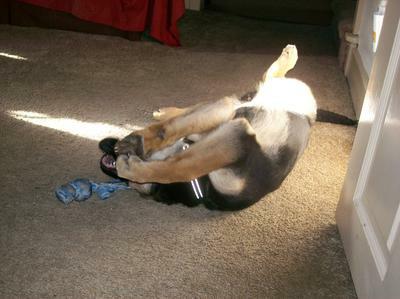 My husband has never owned a GSD but I grew up with a lab/shep cross and he was the greatest, smartest dog I knew. I'm quite happy to have picked her even though she didn't come from the greatest place we love her just the same. Next month she will be going to kindergarten and hopefully will take to it just as quickly. 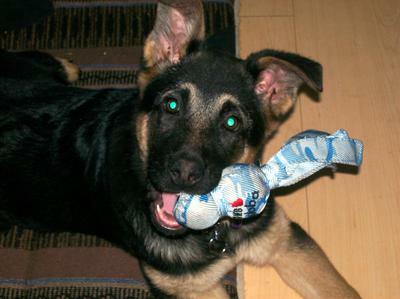 Congratulations on your new German Shepherd puppy and thank you so much for rescuing her. That is a really great thing that you did and one that will reward you for years to come. So be patient with her and socialize the pants off her and you will be well on your way to make up for her slow start. And I am so glad to hear that you are going to puppy classes with her. You will be amazed how smart these babies are and how fast they learn - plus that is a great socialization experience right there. Keep her healthy, feed her the best food you can afford, socialize her, socialize her, socialize her and you will be well on your way to a wonderful companion for many years to come. I wish you both the best!